December is usually a happening month in many ways. 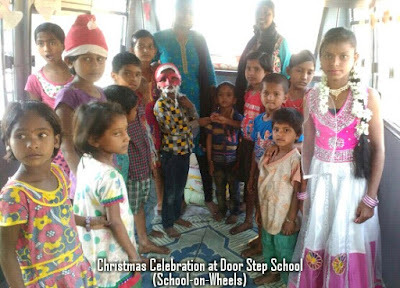 Lots of events and activities are conducted for children in Door Step School centers across the city. Some of the children are taken to a nearby park for picnic, while others are busy in planning Diwali / Christmas parties. At one of the temporary slums in Hadapsar, our children had fun celebrating Christmas. 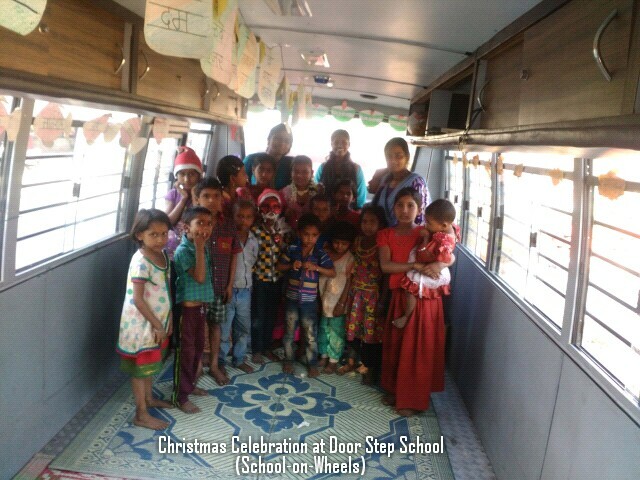 This location is covered by our mobile classroom, the School-on-Wheels bus and some of the children have been enrolled in nearby government school. Children attended party in the bus wearing colourful clothes. They sang songs taught to them in the school and in the class. Highlight of the party was gift distribution by Santa Claus! We observed children not regular to our classes had come for the party with their siblings and friends. Parents who were reluctant to send their children for the classes, were curiously watching the children having fun in the bus. Events like this help us attract more children and parents towards the classes and eventually to the school. डिसेंबर महिन्यात 'डोअर स्टेप स्कूल'च्या शहरभर पसरलेल्या वर्गांवरील मुलांसाठी निरनिराळे कार्यक्रम आयोजित केले जातात. काही मुलांना सहलीसाठी जवळच्या बागेमधे नेलं जातं, तर काही वर्गांवर दिवाळी / ख्निसमसनिमित्त पार्टी केली जाते. हडपसरमधे एका वस्तीवर आमच्या मुलांनी अशाच ख्रिसमस पार्टीचा आनंद लुटला. या वस्तीवर आम्ही 'स्कूल-ऑन-व्हील्स' या आमच्या 'चाकांवरच्या शाळे'त अभ्यास वर्ग चालवतो. काही मुलांना जवळच्या सरकारी शाळेत दाखलही करण्यात आलं आहे. ख्रिसमस पार्टीसाठी मुलं रंगीबेरंगी कपडे घालून आली होती. त्यांनी शाळेत आणि वर्गावर शिकलेली गाणी गायली. पार्टीचं मुख्य आकर्षण होता, मुलांसाठी गिफ्ट घेऊन आलेला सान्ताक्लाॅज! बसमधे नियमित न येणारी वस्तीवरची इतर मुलंही आपल्या भावंडांसोबत आणि मित्र-मैत्रिणींसोबत पार्टीला आलेली दिसली. मुलांना शिकण्यासाठी वर्गाला न पाठवणारे पालक बसमधे मुलांना मजा करताना बघत होते. अशा प्रकारच्या कार्यक्रमांमधून अशी अनेक मुलं आणि पालक आम्हाला आधी वर्गापर्यंत आणि मग शाळेपर्यंत आणायला मदत होते.